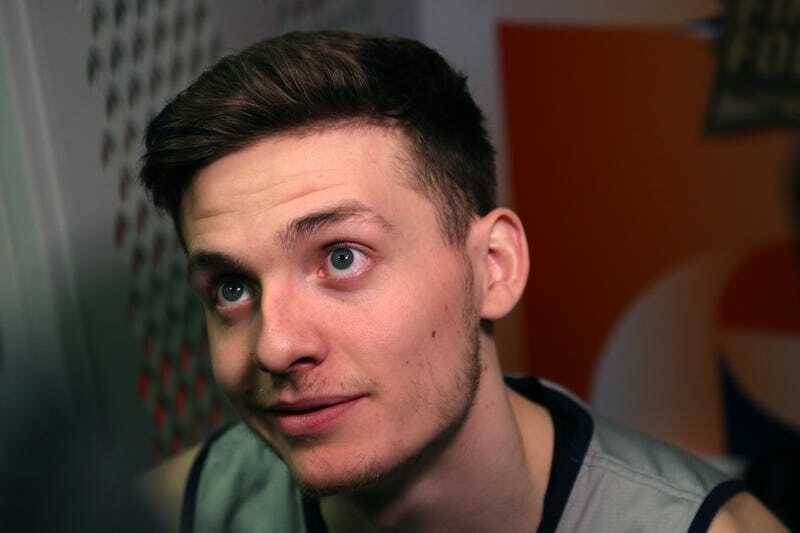 After proposing to longtime girlfriend Alexa Jenkins last February, Virginia guard Kyle Guy has a wedding date set for this summer, following a season that has gone pretty damn well. As couples tend to do, Guy and Jenkins put up a wedding registry so that friends and family could help outfit their marital home with the usual sundries. But according to Guy, the NCAA told him he had to take down his registry. Yeah, that was crazy to me that that’s illegal because that’s what a registry’s for. Yeah, NCAA said it was illegal, so I’m not going to argue with it right now. I’m going to try to win a national championship, and we’ll open that book. What apparently started all of this was a blog post on Busted Coverage. Founder Joe Kinsey realized that anyone could access the registry and buy gifts for Guy and Jenkins, and decided to share it with the blog’s 102,000 Twitter followers in a blog post on Monday—a harmless act that could really only end in a net positive for the happy Cavaliers couple. A couple days later, he tweeted out that someone from the University of Virginia had told him to take the post down. NCAA rules stipulate college athletes are not permitted to receive extra benefits, including “cash, gift certificates or other items with value” from athletic representatives, boosters or fans. Thankfully, the heroic Mark Emmert took some time off from classifying free water cups at fast food joints as improper benefits to set the record straight. What we know right now is nobody in the NCAA said anything of the sort. We don’t know what the source of that information was. ... It’s certainly not the case that it’s a violation of NCAA rules. We allow people to have all the usual and accustomed gifts among family and friends at all holidays and weddings of the sort. There’s not a prohibition against that. We’ve been reaching back out already to the university to try to find out what transpired there. That’s simply an inaccurate story. It seems like what happened is an overzealous member of Virginia’s compliance office saw Busted Coverage’s blog post and worked proactively to prevent what would have been a very stupid “scandal” from breaking out right before the men’s basketball program’s biggest moment in about 30 years. It’s certainly not a bad thing that the NCAA allows players to get nice things from a wedding registry—a right that any other student on campus would have—but what does it say about the NCAA’s byzantine and incredibly stupid rules about giving athletes nice things that someone had a reasonable belief that the publication of Guy’s registry could threaten his eligibility? What does it say about the NCAA as an institution that this matter required clarification from its president? And, most importantly, what kind of bath towel set should I get the future Mr. and Mrs. Guy?